The biggest worry that people had in the early 1500s AD in Europe was that the Ottoman Empire was going to conquer Europe. Would Europe be ruled by Islamic rulers? Who was before Charles V? Who were the Ottomans though? And in fact the Ottomans, under their sultan Suleiman the Magnificent, did conquer the eastern half of Europe during the 1500s AD, and many people who lived there did convert to Islam. But then Charles V ruled! Fortunately for Western Europe, the ruler of the Holy Roman Empire (modern Germany and Austria) was Emperor Charles V. He was an extremely skilled ruler. Charles also had inherited the rule of the Netherlands. And he had seized control of Spain and Portugal from his mother. So Charles V controlled most of Europe. Charles rules the Americas too! Charles also ruled all the land the Spanish conquistadors captured in the Americas – Florida and California, Nevada, Colorado, Utah, Arizona, New Mexico, Texas, Mexico, and South America. 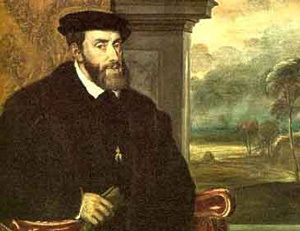 And Charles sent Magellan on the first voyage around the world, where Magellan conquered the Philippines. European traders got very rich by forcing Indian and Safavid ships to stop trading (often by burning their ships). Europeans took over the trade between India, Africa, China, and Europe. In addition, Charles’ Holy Roman Empire enslaved many Central and South American people. Europeans forced them to work in silver mines, especially in Peru and Brazil. The government of China needed a lot of silver to make coins, so Charles’ empire sold them that silver and made a lot of profit from it. How horrible was it to work in the silver mines? 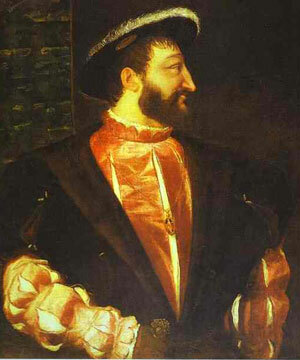 King Francis I of France tried to fight Charles V, but not very successfully. Francis made an alliance with Suleiman against Charles. Several times he attacked northern Italy. But Charles mostly won these battles. Charles also succeeded in fighting off Suleiman’s attack on Vienna in 1529, and even got to take over part of Hungary. Francis tried to get control of some of North America. He sent explorers to Canada and to Manhattan Island (where New York City is now). Francis also sent trade ships to India and Indonesia. But still Charles V controlled much more land and more of the ocean trade. He was much richer than Francis, and the Austro-Hungarian Empire was much richer than France was. Cite this page: Carr, K.E. Renaissance Europe – Charles V. Quatr.us Study Guides, August 6, 2017. Web. April 23, 2019.